A new thriller from the author of the Amazon.com bestselling Alice in Deadland trilogy. When there were still people around to talk to, I would introduce myself as a drinker with a writing problem. It sounded witty at the time, and certainly got a smile once in a while from the ladies. None of that matters now. There are no people left to read my books, and nobody left to listen to my attempts at wit. Now it's just me, sitting in my house on the hill, watching the undead rampage through what we humans once called our world. I sometimes wonder why I still live when those much younger, stronger, smarter and fitter than me perished. Maybe it's just dumb luck. But maybe I am being left alive for a purpose. Nobody may have cared much for my novel, but maybe this is what I was meant to write. Maybe this is what I was meant to be. 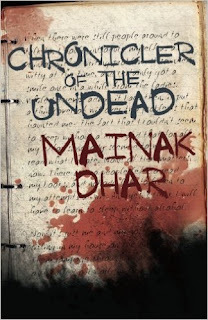 The chronicler of the undead. This is my story. This is the story of a person who was an ex-army officer in Gangtok who is living alone in a bunglaw at a hill away from the zombies roaming around the village down the hill. This story is basically the journal of that person. 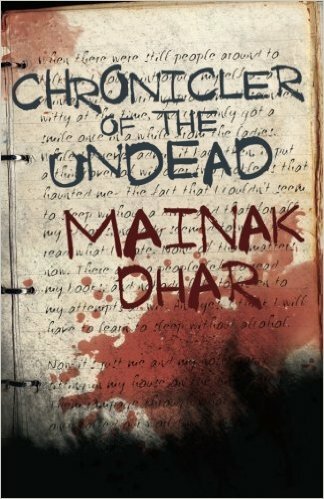 This is my first book about zombies and somehow I am not scared and I find these zombies funny from the info that I have known about them before reading the book. We knew zombies walking with blood and wounds, without any emotions like robots and eating people. We also know from movies how zombies eat or infect others making the victim also a zombie. So, with this basic knowledge, I have started reading this chronicle. Author's writing style is quirky throughout the book making it a fantastic read. I loved the language used which is very easy to follow. The narration is interesting and I wanted to complete this book in one go. The way the author explains the situations in a straight forward manner, how he plans to combat 'Moreko' (zombie) attacks with very few weapons and with better planning, how he mentions the lessons that he learned from these incidents is interesting. I would recommend this to everyone who likes to read a thriller with a humourous touch. PS: Received this free copy from Writersmelon.com in exchange of a review and this is my unbiased opinion on the book.